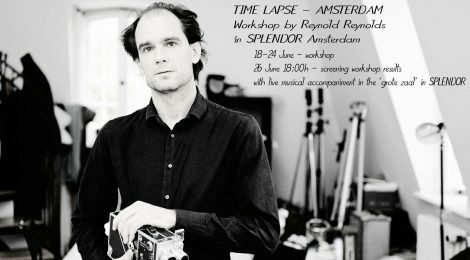 Amsterdam based American filmmaker Reynold Reynolds gives a workshop on time lapse production. send an email to mail@artstudioreynolds.com with the title ‘workshop time lapse Amsterdam’. Max. 15 participants, the workshop is free of charge. Following his artistic practice, Reynolds will show participants how to produce sequences that compress time. The workshop will start with a seminar of the artist at Splendor in Amsterdam on the genre of City Symphony films. Beginning with Vertov’s “Man With a Movie Camera” (1929) and ending with Singh’s “Enter Pyongyang” (2014), Reynolds will use various film examples to show how artists contributed to this genre in different periods of film making. For the workshop, he will focus on the technique of time-lapse photography with equipment ranging from iPhones and video cameras to digital still cameras. Participants will also have the opportunity to learn how to program Arduino micro-computers in order to control Nikon DSL still cameras. The students will have time to shoot their own clips that will be incorporated into a single film that will be screened with live music in the main hall of Splendor on Sunday June 26.